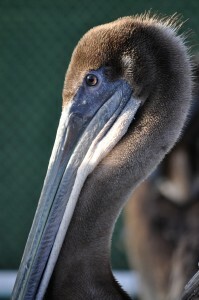 Click Here to See Rescued Pelicans Return to the Wild! Your help means a great deal to us… but absolutely everything to them. Two donors have come together to match the next $6,000 in gifts. Your gift today will make twice the difference for the birds we care for! For California Brown Pelicans staying strong enough to fly and dive is a matter of life and death. 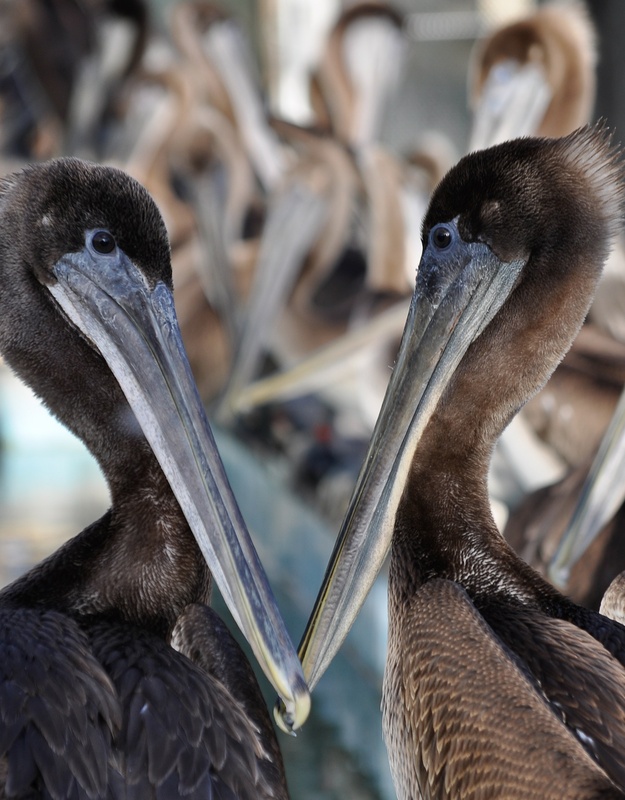 This summer, record numbers of juvenile Brown Pelicans are struggling to hunt and grounding themselves on beaches up and down the coast. The most disoriented fledglings are even heading inland, as far as Yosemite, in search of food. These normally robust symbols of our coastline are pouring into our clinics weak and thin. Some are tangled in fishing tackle, pierced with fishing hooks, suffering from broken bones, or covered with fish oil from fish cleaning stations in harbors along the West Coast. 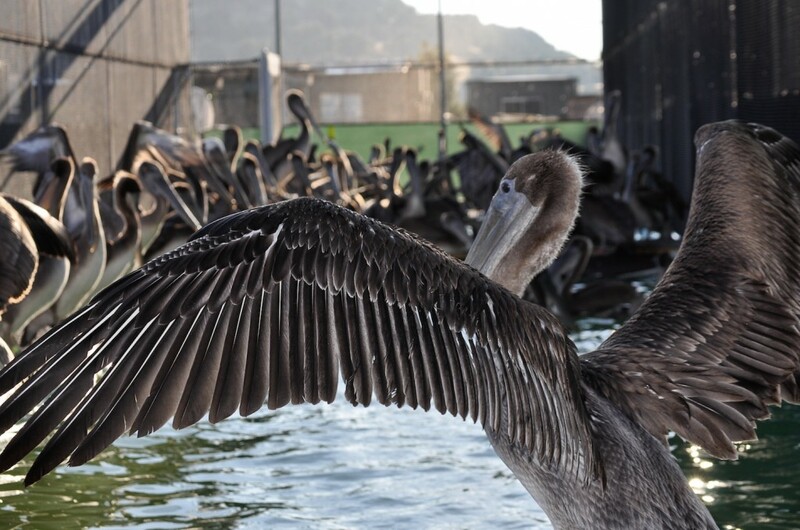 So far this year, International Bird Rescue has cared for more than 600 California Brown Pelicans and well over 400 of these patients – mostly starving fledglings – have come through our doors in just the past month. Simply stated, we need your help. Each Pelican should consume half its bodyweight in food each day – for a youngster, that’s about 4-5 pounds of fish – and with rehabilitation periods of several weeks to a month or more, the expenses of medicines, surgeries and food multiply quickly. International Bird Rescue is currently spending about $2,000 a day on fish alone to save as many of these birds as we can. Personally inspired to help keep us going, two of our supporters have offered matching gifts totaling $6,000 to encourage public aid during this crisis. With double the impact, your gift will go a long way in helping us keep up with the costs of caring for each of these amazing creatures. or even becoming one of our cherished Pelican Partners today. but absolutely everything to them. This entry was posted on Tuesday, August 14th, 2012 at 4:39 pm and is filed under Uncategorized. You can follow any responses to this entry through the RSS 2.0 feed. You can skip to the end and leave a response. Pinging is currently not allowed. Is this normal? Do you know why so many birds, especially fledglings are coming to you? Thank goodness you are there to help!